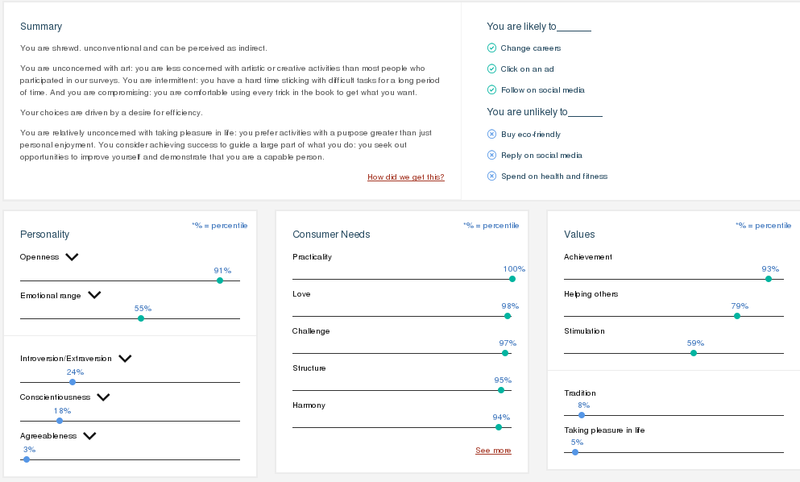 I was watching Felicia Day’s Flog earlier today and in it one of the sites she talks about is Personality Insights. 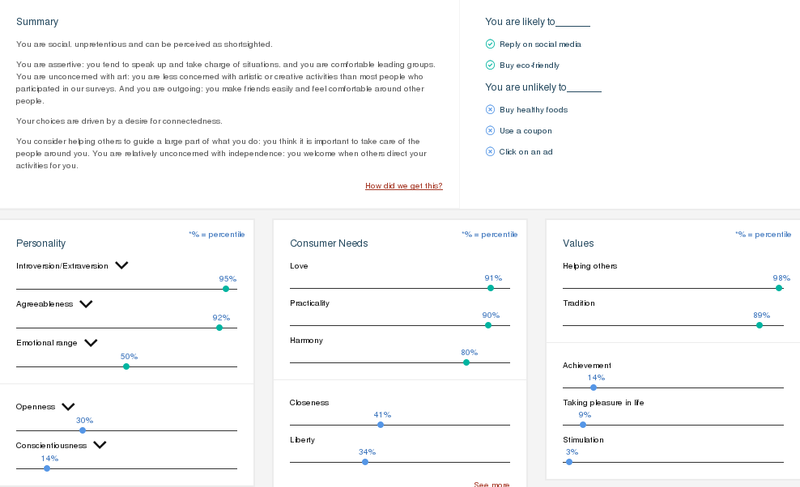 This site claims to be able to help you gain insight into how and why people think, act, and feel the way they do by applying linguistic analytics and personality theory to their writings. Which is about a 50% accurate as I normally don’t reply on/use social media that much. Though I do prefer to be eco-friendly when possible so that part can be taken as accurate. All of which are mostly true. I don’t normally click on ad’s, unless I manage to do it accidentally. I use an ad blocker and try to filter out as many of the annoying ads as I can. Using a coupon requires way too much effort so I tend not to do so unless its relatively simple and doesn’t require too much effort. As for healthy foods, most of the time they are absolutely tasteless so I avoid them for the most part. This one is only about 33% accurate as I have been known to change careers quite often before I joined GS. I def don’t click on ads and rarely follow folks on social media. To give you an idea I started using twitter mid 2015. In all this was an interesting read and though parts of it made me laugh it does give you a glimpse of what might be coming in the near future when computers will be able to diagnose your personality and figure out your mood based on your behavior and writings.